District Attorney George Gascon’s second annual anti-bullying video contest. The “Bye Bye Bullying” contest, launched in October, asked participating San Francisco middle and high students to make a 60-second video about cyber bullying. 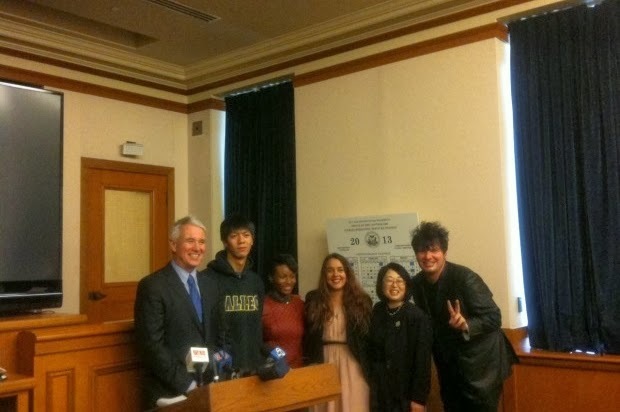 Forty entries were submitted, and the three winning videos were announced at a ceremony at San Francisco City Hall this afternoon. Gascon introduced the videos, calling them “powerful” and reflected on his youth as an immigrant with limited English skills getting bullied at school. “This is a problem that is not going away,” he said about bullying. He said bullying can lead to physical attacks and some victims turn to suicide as a reprieve from the vitriol. The first place award went to Lincoln High School ninth-grader Lillibelle Liang for her video “Part of the 13 Million,” referring to the estimated number of American youths affected by bullying each year. Lillibelle was in an exam at school today and unable to attend the ceremony to receive a certificate from Gascon and her $250 prize. The second-place winner was Christopher Pang, a senior at Galileo High School. His video was an overview about what cyber bullying is, where it occurs online and tips for how to prevent it. He attended today’s event in a Galileo sweatshirt and said after he received his prize, a Jambox wireless speaker set, that it took him several days to create his short clip. The third-place video, “Love>Hate—Make the Right Choice,” was made by Wallenberg High School 11th-grade students Allison Talker and Amy Johnson. Allison urged her fellow students to show respect for different types of people. “It makes no sense to hurt people with your words,” she said. The two received baseballs signed by Giants pitcher Javier Lopez and first baseman Brandon Belt. Brock attended the awards ceremony and said it was tough to decide which of the videos deserved to win. He called all the entrants winners for sharing messages about resilience and respect. “So many made me cry,” he said. The videos were evaluated on quality of presentation, creativity, educational approach, and the overall message conveyed. A party to celebrate the work created by all contestants will be held Monday.